In this collection of essays, the authors challenge recent misbegotten egalitarian ideas, exposing the quicksand on which they rest, and the self-serving interests they often promote. 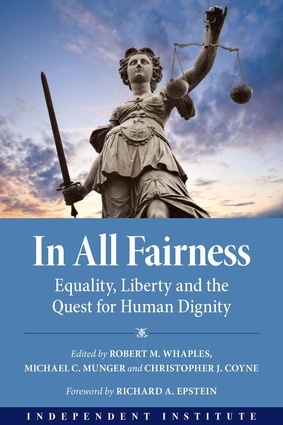 This collection is full of insights about the connections among fairness, liberty, equality and the quest for human dignity. While each chapter offers unique insights, the overriding theme is that fairness must rest on a conception of humanity that recognizes the dignity of each person—a dignity that requires everyone to respect individual choices and voluntary transactions. Christopher J. Coyne is the F.A. Harper Professor of Economics at George Mason University. Michael C. Munger is a Professor of Political Science, Economics and Public Policy at Duke University. Robert M. Whaples is a Professor of Economics at Wake Forest University.